282 pages | 90 B/W Illus. Graffiti and street art images are ubiquitous, and they enjoy a very special place in collective imaginary due to their ambiguous nature. Sometimes enigmatic in meaning, often stylistically crude and aesthetically aggressive, yet always visually arresting, they fill our field of vision with texts and images that no one can escape. As they take place on surfaces and travel through various channels, they provide viewers an entry point to the subtext of the cities we live in, while questioning how we read, write and represent them. This book is structured around these three distinct, albeit by definition interwoven, key frames. 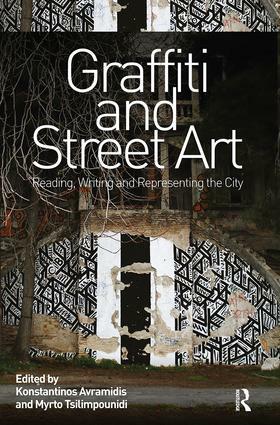 The contributors of this volume critically investigate underexplored urban contexts in which graffiti and street art appear, shed light on previously unexamined aspects of these practices, and introduce innovative methodologies regarding the treatment of these images. Throughout, the focus is on the relationship of graffiti and street art with urban space, and the various manifestations of these idiosyncratic meetings. In this book, the emphasis is shifted from what the physical texts say to what these practices and their produced images do in different contexts. All chapters are original and come from experts in various fields, such as Architecture, Urban Studies, Sociology, Criminology, Anthropology and Visual Cultures, as well as scholars that transcend traditional disciplinary frameworks. This exciting new collection is essential reading for advanced undergraduates as well as postgraduates and academics interested in the subject matter. It is also accessible to a non-academic audience, such as art practitioners and policymakers alike, or anyone keen on deepening their knowledge on how graffiti and street art affect the ways urban environments are experienced, understood and envisioned. The December 2008 Uprising’s Stencil Images in Athens: Writing or Inventing Traces of the Future? São Paulo’s Pixação and Street Art: Representations of or Responses to Brazilian Modernism? Konstantinos Avramidis is a PhD candidate in Architecture by Design at the University of Edinburgh, UK. Myrto Tsilimpounidi is a Marie Curie Researcher at the Institute of Sociology, Bratislava, Slovakia.